THE NAB AFL Women's competition has allowed players from a variety of backgrounds to play at the highest level. It has also opened the door for a host of internationals and locals who have spent time overseas to try to break through. Greater Western Sydney forward Cora Staunton and former Melbourne defender Laura Duryea, both Irish, picked up the game in Australia, while Australian-born pair Lauren Spark (Western Bulldogs defender) and Kate Shierlaw (ex-Carlton forward) played for the Wimbledon Hawks while living in London. This year, American Katie Klatt (Melbourne University) and Canadian Valerie Moreau (Essendon) played in the VFL Women's competition with the hope of being drafted by AFLW teams. Frenchwoman Coline Duquet spent this season playing for the Darebin Falcons' seconds in the Northern Football Women's League, while Canadian Caroline Leduc played for East Fremantle's reserves in the WAWFL. Moreau is a speedy small forward whose pressure acts and goal-sense are her strengths. 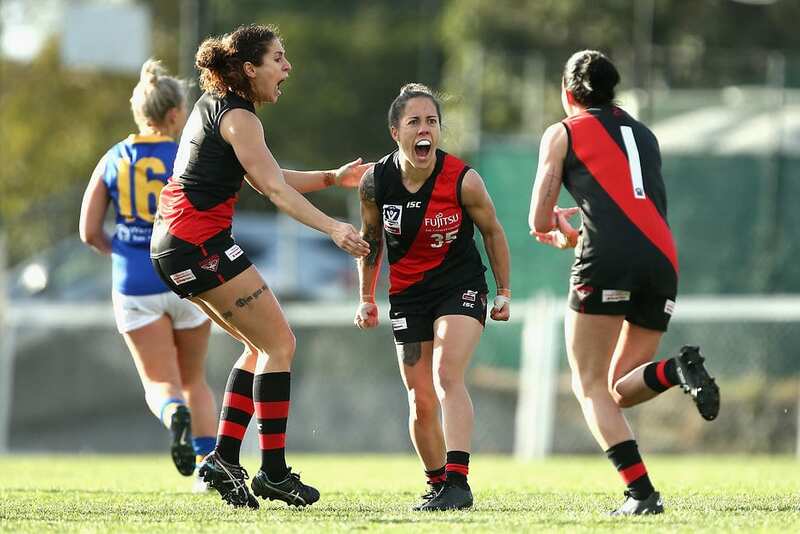 She kicked seven goals in 14 matches playing for a team that kicked only 41 for the season. Klatt has settled into defence after spending most of her time in the US domestic competition as a midfielder. Her strong marking and competitiveness have held her in good stead. AFL.com.au spoke to Klatt and Moreau about their football backgrounds and hopes for the future. Klatt moved to Melbourne from Sacramento in California in mid-2016 with the sole aim of playing football. She had picked up the game in 2013 while playing for the Sacramento Suns in the USAFL competition. "What happens is Australians who live in the States will start a team and recruit a bunch of Americans, so I stumbled into it having no idea what it was," Klatt said. "I showed up to a training one day. I loved it and got really involved. I ended up playing with the US team in the AFL International Cup (held in Australia every three years). "I literally fell in love with it, so I decided to move here to play. There's only so far you can get in the States and I wanted to have a chance to learn more and improve my skills, so I came here." Her family, which hails from Virginia on the American east coast, thought she was "crazy". "I pretty much gave up my job, my friends, my family, everything. I gave up my whole life in the States to play footy. "I spent all my time and money on playing. We have to fly to play other teams (in the US competition) because we all live so far apart (and) there aren't enough people in one city playing the game to (to form more) than the one team. "My parents had seen how obsessed I'd become with footy, but they never really got it until they came to watch me play, because they didn't know what AFL was either. Once I had my mind made up, there was no stopping me." The 27-year-old had played soccer and hockey, as well as being involved in athletics (sprinting) when she was younger, but footy offered a different challenge. "A lot of it has to do with community and family … it's similar here to how it was back home. I had moved away from home to California, and I didn't know anyone there either," she said. "In the States, because it's such a new sport, (those involved) are so welcoming, because they want to bring people in. Most people are like, 'What the heck is this?' and you have to convince them to try it. People are just so welcoming, and I made best friends through football. "I played lots of sports growing up, and this is the sport I feel I have to think the most and dig the deepest to try and finish out a full game. You're tackling … it's physical. All-round it's the most challenging sport I've played." Klatt played for the Giants against the Sydney Swans in an AFL women's exhibition series match in Sydney in early 2016. Upon landing in Melbourne in mid-2016, Klatt was contacted by then-Melbourne University coach Andrew Jago, who invited her to the club. Having started in the club's thirds, she steadily worked her way up into the seniors, playing 11 of 14 games this year and averaging 11.1 disposals, primarily in defence. "This year the focus was on developing the non-AFLW players at Melbourne Uni, which helped me tremendously. It made all of us as a team much more confident in ourselves, because we've developed as players as well," Klatt said. "I used to play it really safe, but I feel the coaching encouraged us to take risks … I really felt like part of the team. "It was such a different vibe this year. The environment made me feel comfortable and not as uptight and nervous. That sense of fun and confidence that comes with this team and from the coaching staff made a huge difference." Klatt, an ICU nurse at the Royal Children's Hospital in Melbourne, is nominating for the NAB AFLW Draft in October, hoping to be the first American picked. "It'd be amazing – that's my dream. I moved to Australia having dropped everything to come here and play footy. If I got drafted that would be achieving that goal," she said. "I don't have the network other players might have. So, I have no idea if I'll get drafted, but I'd be absolutely over the moon if it happened." Moreau (pronounced "Moro") was introduced to football after a basketball match, ironically after she'd returned home to Montreal from a five-month study stint in Brisbane. The Australian referee pulled her aside and asked if she'd ever considered playing Australian football. She was introduced to the AFL Quebec competition and first pulled on the boots for the Notre Dame De Grace Giants in 2015. "Everyone in Australia says footy is family and it actually is over there (in Canada). The whole league is a family because it's such a small community. You train together then you play against each other on the weekend," said Moreau, who in 2015 was best and fairest, rookie of the year and leading goalkicker in the AFL Quebec competition. I loved basketball, but I was way too short (155cm). I'm still short for footy, but I have a place. I'm needed to go in and pick the ball off the ground. Everyone has a space, regardless of height or size, it's a melting pot of everything. "I went to one training session, then the next game was only a few days later, so I just jumped in," said Moreau, who is studying for a master's degree in sports management at La Trobe University. Football in Canada is often played in a nine-a-side format, due to limited player numbers and the size of grounds (often modified gridiron fields). Sometimes cones are used to create an oval, but often games are played on rectangular fields. The French-Canadian, 27 in November, played as a midfielder back home. But when she moved to Melbourne in late 2016 to take up a position in the AFL Victoria Women's Academy, saw found her niche as a small forward. The Academy spot was arranged by Moreau's Canadian national team coach Jason Arnold, a Victorian who moved to Canada in 2010, and AFL Victoria female football talent manager Darren Flanigan. Once in Melbourne, Moreau moved in with another Canadian, former Collingwood AFLW player and now-Essendon VFLW midfielder Kendra Heil, and Heil's partner, Brendan Major. Major was the coach of VFLW side Eastern Devils and was assistant coach of the Canadian national women's side in the AFL International Cup. "I flew to Brisbane, then I drove a campervan down to Melbourne, because that was the cheapest way I could get here. Having those two there just made it so much easier," Moreau said. Moreau lined up for the Devils in 2017, playing eight matches in her first season of footy in Australia. "We had a rough season (the Devils finished seventh of 10 teams), which made it tough for me to find my spot in the team. But I learnt so much from the girls on and off the field, not just about footy, but also the culture in Melbourne and how to live here," she said. "The Devils tried me in the midfield, and it didn't go to well because everyone plays to a structure. It's one thing to be good at everything, but it's another to be excellent at one thing. That's what I learnt when I got here." With the Devils not continuing in the VFLW in 2018, Moreau found a spot with Essendon's new VFLW side, re-joining Major who had moved to the Bombers as coach. "We didn't have an amazing season, but off the field, they treated us as professionals all year round, from coaches and support staff all the way up to the CEO," she said. "(CEO Xavier Campbell) came in and told us after our first win, against Richmond, 'You just created history'. "It was our only win of the season yet, but he was still proud of it. He focused on the positive. It didn't matter about the 10 losses before it, we just created history and we should be proud of it." Moreau will also nominate for the NAB AFLW Draft, but believes her best chance of gaining an AFLW contract will come in 2020, when another four teams – Gold Coast, Richmond, St Kilda and West Coast – join the competition. "I'll put my name out there, but to be honest my chances are pretty low. Last year the focus from teams was on young girls and players from the TAC Cup. This year, it's about filling spots with young girls and then the two new teams (Geelong and North Melbourne),” she said. "The four new teams (joining in 2020) might be forced to look at players they wouldn't look at otherwise and I think that's where internationals might come into it."